Lumenis may be the world’s most recognized and trusted brand for medical and aesthetic laser solutions, and the Lumenis IPL Quantum Laser is among the company’s best-selling photorejuvenation systems. IPL stands for Intense Pulsed Light. IPL devices transmit a wide spectrum of light through a handpiece. As the operator glides the handpiece over the treatment area, filters internal to the handpiece intermittently alter the light’s wavelengths. The Lumenis IPL Quantum Laser varies the intensity of the light it transmits to the patient’s skin, thereby optimizing the light to treat specific skin types and trouble spots. The Lumenis IPL Quantum Laser is not only popular for its effectiveness and safety, but also because the IPL Quantum is a powerfully expandable platform. Upgrade modules are available to bolster the range of treatments your practice can offer. The upgrades are easy to install and require no additional office space. 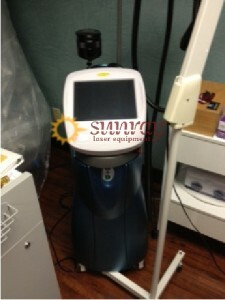 SunrayLaser.com carries equipment form the Lumenis line with pride. Lumenis has produced high quality medical and aesthetic laser devices for almost half a century. The company enjoys unparalleled brand recognition and a global reputation for durable and effective therapeutic devices. Thoroughly qualified technicians refurbish each Lumenis IPL Quantum Laser in our inventory. All units are tested to ensure that they conform to the manufacturer’s original equipment specifications. We maintain high technical standards to help you assure your patients of the safest, most comfortable treatments possible using this equipment. Lumenis has an installation base of approximately 75,000 devices. To find out why, and how our refurbished Lumenis equipment can help your practice grow, please let us know the best way to reach you. Simply fill in the form below and one of our expert medical laser consultants will be in touch shortly.